So, here I am, joining the Bloggers World! I don't have all the bells and whistles I can see on other blogs, but the rest of my website should take care of that. Additional photos will be posted in the Photo Albums. If you're looking for other sites and blogs, please check out my huge Links page to see my favorites. 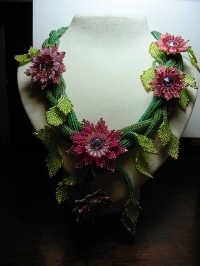 During the last couple of weeks, I've been rather busy with my yard and I've spent too much time on the internet, so my pink flowers necklace is still waiting for its additional leaves and vines. Here's the latest photo, it still needs 20 leaves (10 small and 10 large) and the necessary vine sections to connect them. Hey Murph! Glad to see you in blog land. I'm still a beginner, but I'm learning...it's kind of fun! Hi Girls! It's good to see you here! :-) Thank you for checking in! How cool, tonight I can blame you and your blog for keeping me from beading! ;-)I just spent a couple of hours trying to catch up and I'm not done yet! This necklace is stunning! How long has it taken you to bad this? I don't know, I started beading the flowers back in July, but I didn't work on it continuosly 'cause I've been busy with the yard and the computer. There are work in progress photos on the News & Updates page, if you'd like to see assembling process. It's so good to see you here, my dear Queen of Flowers! Your necklace is absolutely stunning! I'm so impressed with what you've done. You have an absolutely marvelous eye for color and beauty! It's always exciting to see what people have done with the little flowers and leaves from my book. And I have to say that your necklace is absolutely breath taking! OMG ... your necklace is beautiful; love the colors, the arrangement of elements, etc, etc. Did you create it yourself or did you have a pattern to work from. It's my own design. I made it up as I went. I created the flowers with the pointed backs for another beader (Frany) who wanted something suitable for her style of necklaces. After I made her set, I decided to make another one and try to mount them in a totally different way from hers, without using a metal wire inside the ropes like she does. You can see work in progress pictures in my News & Updates page.